Let me be clear – In no way are you a dummy! 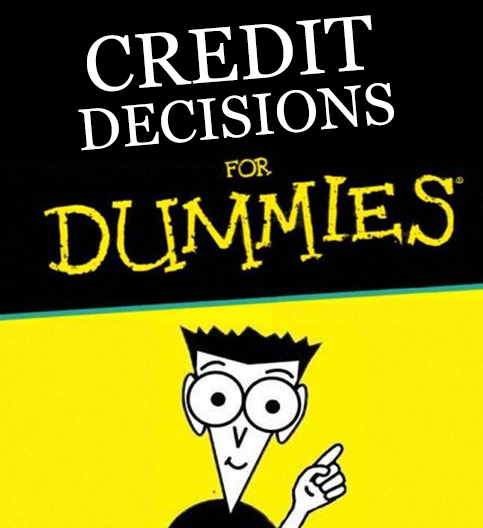 But, how credit decisions are made by a bank or lender can make you dumbfounded. While every person’s credit report has similar data categories – credit limits, account balance, monthly payments, credit inquiries, etc. – what a bank looks at when considering issuing personal loans vary. It’s called their “black box” or “secret sauce”. In other words, it’s not for public consumption. Most lenders don’t just look at a FICO score. Make no mistake, a FICO score is derived from several of the credit report inputs mentioned above. But, FICO on it’s own doesn’t tell the whole store about an individual’s likelihood to pay the loan, and pay on time. That is why they typically look at multiple variables and weight them based on their risk appetite. Many will perform historical analysis of credit accounts to compare what they expected performance to be and what actually happened, i.e., did they pay on time, late pay, or default. Then, they will adjust their so-called “scorecard” to re-weight credit inputs. If you haven’t fallen asleep by now – excellent! I’ve got a very important comment to make. With all this black-box stuff being used on your application, it’s important to note that some lenders enable their black-box to differentiate between where and how you are applying for a personal loan, especially personal loans online. These particular lenders have two different scorecards, one for online and one for in-store. It doesn’t mean that one of your credit variables, say FICO score, is better in-store than online. But, the additional scrutiny and hurdles one must overcome online, due primarily to online fraud, can make it more difficult to qualify for credit online. If you are applying with online personal loan lenders, say through a platform like SweetPay’s, then you have nothing to worry about, as this is their primary method of application and wouldn’t differentiate between online and in-store applicants. But, more traditional lenders that are primarily processed in-store may give online credit application a much tougher look.